Your lawn looks terrible: it has large dead patches, and they're getting bigger. You've ruled out insects and physical damage. You think it has a fungus. How do you identify it? And how do you treat and prevent it? Frank McDonough, of the Los Angeles County Arboretum, explains that there are three major types of fungal lawn diseases: parasites, water molds and "imperfect" fungi. Your fungus falls into one of these categories, so you need to take the following steps to identify it, treat it and keep it from damaging your lawn. What kind of grass do you have (many parasitic fungi are specific to certain types of grass)? When did the damage first appear? Does the damaged grass appear greasy or water-soaked? Are there any visible fungal structures (red threads, rusty spots, smoky haze appearing in the morning, etc.)? When did you last fertilize the grass? How long and how often is the lawn being watered? How much sunlight does the area receive? Full day, half-day, less? How does air circulate in the area? 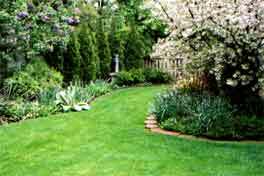 Do trees and shrubs surround the damaged lawn? Is the damaged area higher than, lower than, or at the same level as the surrounding lawn? What shape and size is the damaged area? Is it growing? Are there any differences in the lawn's color around the damaged area? If you see any signs of infestation, you should seek professional help by taking a sample of your diseased lawn to a local expert (usually a county extension agent or certified lawn-care expert). Remove a piece of your lawn about 1' square by 2" deep, making sure to take the sample from an area right along the margin of the disease. The sample should be a single piece that has both damaged and undamaged sections. After you've received an ID, ask your expert what you can use to treat the disease and how you can prevent its recurrence. You can also use the identification to look up treatments on the Internet, where there are many good disease-management sites maintained by local agricultural universities. Finally, a well-chosen and well-maintained lawn is your best defense against lawn disease. Choose a lawn variety that is resistant to diseases common in your area (your extension agent can help you there too). Fertilize at the right time (many diseases are spurred by mistimed fertilization), mow only when your lawn is dry, keep your mower blade sharp, mow at the proper height for your variety of lawn, and remember to dethatch, aerate and water your lawn regularly. Wear goggles to avoid possible splashes and vapors. Fungi are actually microscopic organisms that have no chlorophyll and thus can't make their own food. The must invade other plants for survival. For a disease to occur there must be a susceptible host, a virulent pathogen and a favorable environment. Each disease pathogen has a unique life cycle. There are various ways to reduce diseases caused by fungi. Those include proper shade and water management, proper mowing heights for a particular grass, and keep soils from being compacted either through heavy traffic or improper drainage. Different fungal diseases affect the health of the turf grass in different ways. Some diseases attack the roots and thus interfere with water absorption and nutrient uptake. Other fungal diseases attack the plant leaf and interfere with the photosynthesis process which is how the plant makes its own food. Leaves are commonly attacked by foliar blights and leaf spot diseases. Roots are attacked by phythium root rot and take-all diseases. For warm season grass, the amount of nitrogen or lack of nitrogen in the soil can also cause onsets of fungal disease. Low nitrogen and / or low potassium levels can cause: dollar spot and rust outbreaks.